For those seeking to have more control or easier maneuvering of your PTZ (pan, tilt & zoom) cameras, you now have the ability to do so with our new Alliance series PTZ Keyboard controllers. This unit comes with an LCD display that will switch to low power mode when it hasn’t received any input for more than 30 seconds. This PTZ controller has an RS485 control bus that can support a maximum of 255 front end devices and has a communication distance of 1200 meters or 3937 feet, giving you a long range capability of the control over your pan, tilt and zoom cameras. You also have the ability to link multiple keyboard controllers together via an uplink port for a maximum of 15 controllers. With this unit you can set up and recall functions such as a pattern scan, patrols & preset points that you determine. Various parameters can also be changed directly from this controller such as the baud rate, protocol, and many others. 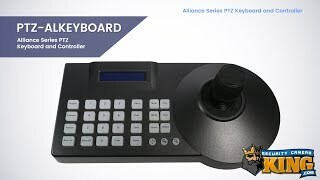 We back this Alliance series PTZ keyboard controller with a one year warranty and you can feel confident knowing that you will have FREE lifetime technical support that is 100% U.S. based when and if you need help getting this set up. Protocol: Pelco-d, Pelco-d, Panasonic, Hikvision etc.